Our mobile devices are the nearest thing we have to a perfect way for brands to reach us and the Pokémon Go phenomenon is a remarkable illustration of the power of highly engaging mobile experiences. 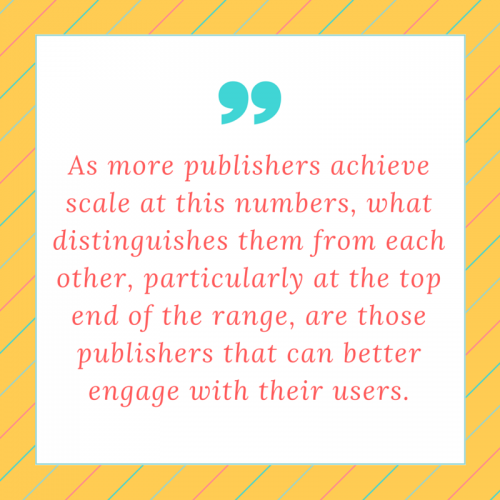 As more publishers achieve scale at this numbers, what distinguishes them from each other, particularly at the top end of the range, are those publishers that can better engage with their users. As the industry evolves, publishers are turning to more meaningful performance metrics that include time spent, interactions and purchases relative to sessions. In other words, they are focusing on qualitative metrics that better measure engagement. Instead of measuring two dimensional numbers, publishers are focusing on themes such as retention, frequency and intensity of usage. Getting the engagement right positively drives long-term retention for the app, and it boosts the app’s active user base. The switching costs are getting lower, too. Increasingly, it’s about the total end-to-end user experience and how companies make sure they get the majority of people who try their service to stay for a longer time and remain active within their content or app. The massive availability of content and apps, combined with consumers’ appetites and penchant for trying new content and apps, means brands and publishers must ensure they get the consumer engaged immediately from the first interaction onward in order to be successful. Mobile accounts for virtually all the growth publishers have experienced in recent years. Recent comScore research found that the amount of time that consumers spent on their mobile devices grew a dramatic 78% between December 2013 and December 2015. Time spent on desktop, by comparison, was essentially unchanged. Although desktop is relatively flat in total engagement, it is losing share to mobile – which now accounts for 65% of digital media time spent. Mobile apps now drive the majority of digital time spent at 56%, and smartphone apps alone look to account for a majority of digital media consumption in 2016. Pokémon Go erupted onto the mobile gaming scene, seemingly out of nowhere. The augmented reality game quickly became a massive success. It’s launch was so successful that its developer, Niantic Inc, was forced to stagger the games release to alleviate the strain on their servers. Pokémon Go’s fans spend just over 43 minutes a day playing the game, on average. This outpaces average daily usage of other mobile attention grabbers such as WhatsApp, Instagram and SnapChat. Augmented reality is still in its early stages as a mainstream technology. At the same time, this insanely popular game highlights the tremendous potential of engaging mobile experiences as a key part of a monetization strategy. Certainly mobile games capture users’ attention but it doesn’t stop there. New ways to make content far more engaging on mobile devices (such as Facebook’s Instant Articles and Google’s AMP) and chatbots are also focused on creating user experiences that utterly captivate mobile device users. The pay-off for publisher is dramatically increased attention which could be directed at next generation native and in-image advertising solutions. Add to the mix the rich data mobile devices can offer about users’ contexts and publishers have an almost unprecedented opportunity to deliver extremely relevant offers to interested consumers. The combination of captivating user experiences, highly engaging advertising solutions and increased relevance will boost advertising revenue while enhancing the user experience overall. more opportunities to present more relevant offers. The end result will be superior user experiences for users and increased revenue for publishers. What could be more rewarding?